Czech SBK Girls Jitka and Petra Join Us in the USA! Offical SBK Umbrella Girls and FastDates.com Calendar Kittens Jitka and Petra from the Czech Republic are comming to America in July to shoot, work and party with us at Laguna Seca World Superbike June 11-13th and the LA Calendar Motorcycle Show in Malibu July 20th. Come join us in Malibu and have them autograph their new 2015 FastDates.com Calendars for you! CLICK! 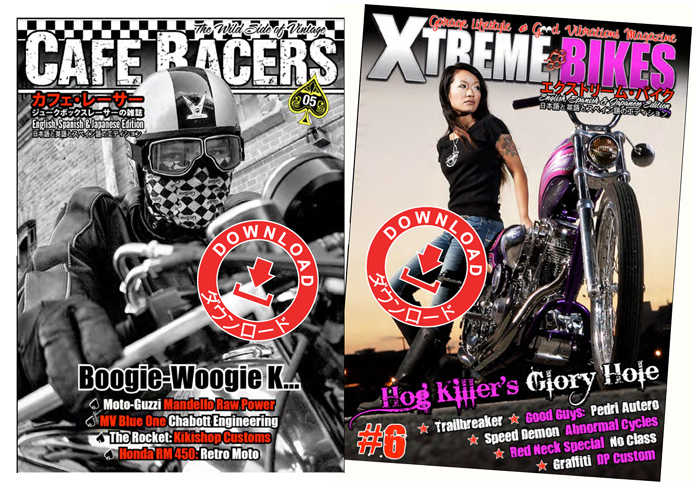 Free Digital Download of Cafe Racers aand Xtreme Bikes Latest Issues! Isle of Man, 8th June 2014 -. 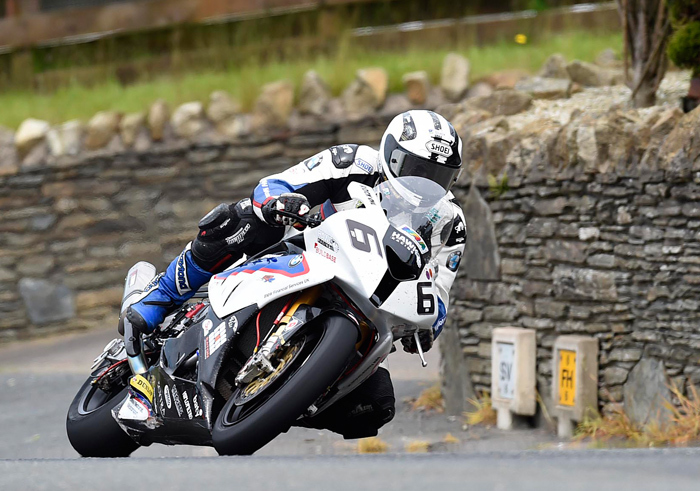 BMW Motorrad and Michael Dunlop (NI) have repeated history, echoing Georg “Schorsch” Meier’s (DE) legendary Senior TT victory of 1939 on the Isle of Man. Dunlop’s third BMW-powered victory of the week came in the most prestigious race of all: the blue riband Senior TT race. Before that, Dunlop had already won the Isle of Man TT Superbike and Superstock races on the BMW S 1000 RR. And it was him again who triumphed in an exciting and thrilling Senior TT race. BMW Motorrad UK entered into road racing in 2014 to celebrate Meier’s famous victory of 75 years ago, in which he rode his factory Type 255 Kompressor and took BMW Motorrad’s first ever TT win. Joining forces with Hawk Racing, the team behind the Buildbase BMW Motorrad British Superbike entry, and supported by BMW Motorrad Motorsport, BMW Motorrad / Hawk Racing was formed. The experts from Munich helped with their expertise, but also with technical support. For example, BMW Motorrad Motorsport supplied the Superbike engine for Dunlop’s RR. Beginning with the North West 200 in May, Dunlop and the team took victories in both the Superstock and Superbike classes as part of their build up to the Isle of Man TT. The BMW Motorrad / Hawk Racing team have now added a further three TT trophies to the tally, proving that the BMW S 1000 RR is a force to be reckoned with in road racing. Twenty five-year-old Dunlop has secured his own place in history by increasing his total to a stunning 11 TT wins, three of them coming this week onboard BMW S 1000 RR machines in the Superbike, Superstock and Senior TT races. 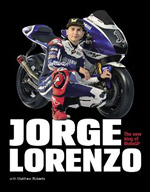 He also became the first rider in history to win four TT races in two consecutive years. The King of the Isle, Michael Dunlop was BMW mounted for the first time this year. Guy Martin at the Start in town. 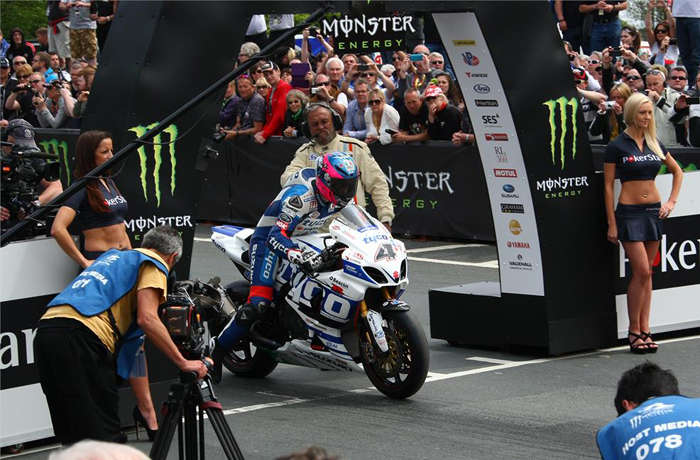 Team Suzuki Press Office, June 7th -Guy Martin captured Tyco Suzuki’s third podium of TT 2014 in Friday’s coveted Senior TT on the Isle of Man aboard his GSX-R1000; with three laps in excess of 130mph to claim third place. 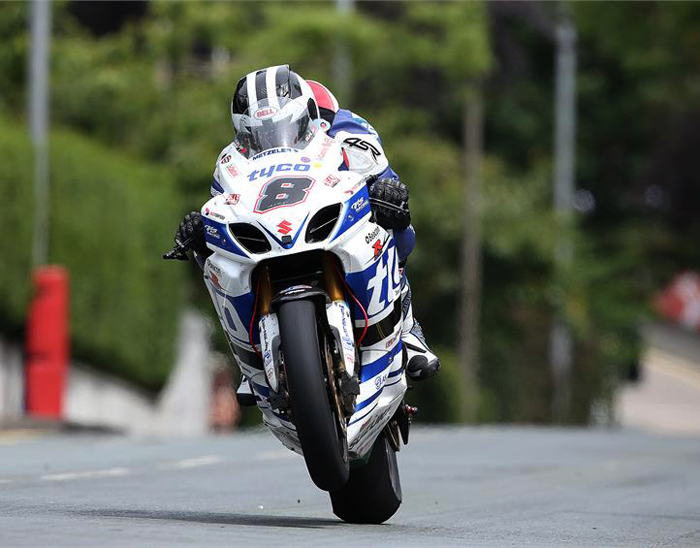 Race week started with a TT Superbike podium for Martin in second place with team-mate William Dunlop sixth; who recorded his fastest-ever TT lap at over 130mph. 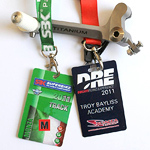 Dunlop also raced his GSX-R600 to third place in the second Supersport TT for the Moneymore, Northern-Ireland-based TAS Racing team. Following his Supersport race podium on Wednesday, an on-form Dunlop enjoyed an early charge in yesterday’s Senior with laps of 130.466mph and 130.853mph [his new TT best] to lead in the opening stages, but a high-speed crash at the Les Graham Memorial on lap three ended his challenge. But the ‘tough-as-nails’ Dunlop was back in the paddock within a few hours still smiling, despite being on crutches with two clean breaks to his left Fibula. William Dunlop averaging 130mph though Isle of Man city steets and countryside! Team Manager Philip Neill said: “What a great effort from both our riders in the most prestigious of all TT races. In Superbike terms I believe William came of age in the Senior TT and firmly established himself as a challenger at international level. What a shame a small mistake resulted in a crash and ended his podium challenge. However the most important thing is that he is relatively unscathed, considering this was a high-speed crash, but he will be back racing very soon. “Guy once again gave 100% today and we are extremely pleased with a second podium finish from both Superbike races. We just didn’t have that last little bit to challenge Michael this week, but then no one else did either. I had always ridden, owned and raced Japanese Superbikes up until one spring day in 1993 when my good buddy Scott Reif who word at Honda R&D of America designing new bikes, brought one of their newly purchased 2nd Generation Ducati 916 Superbikes on one of our regular Sunday morning rides. Scott let me ride the bike on our twisty canyon roads, and the first corner I came to the bike seem to dive into the corner without any input and railed its way through and powered out our like it was on rails. And that V-Twin punch was just icing on the cake. 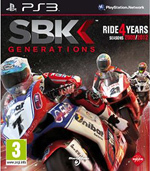 At that point in time it was far and away the best sportbike I had ever ridden. I had to own one. That opportunity came a just 6 month later when an attorney friend who had bought a 916, now wanted to sell a quite a discount. It turns out back in those days Ducati didn't Lock-Tite much and the rear wheel hub nuts backed out, causing the rear wheel assubly to fall of on the freeway and throw him on the group. You don't want to do that to an attorney. Short story, I got a like new rebuilt bike by Ducati at a great price. And soon after that all Ducati's motorcycles have come with every bolt Lock-Tite with a paint check mark. My first 916 who soon get a lot of performance modifications including an Ohlins rear shock, a Ferracci 926cc Hi-Compression Big Bore Kit, a Jerry Branch ported head, Corse Camshaft, Full Termignoni Race Exhaust and Ferracci computer re map, ISR 6-piston front brakes and Dymags Magnesium race wheels. This 926cc Special was pretty much the ultimate 2nd Generation Ducati Superbike until the release some 10 years later of the new 2002 year 996R. 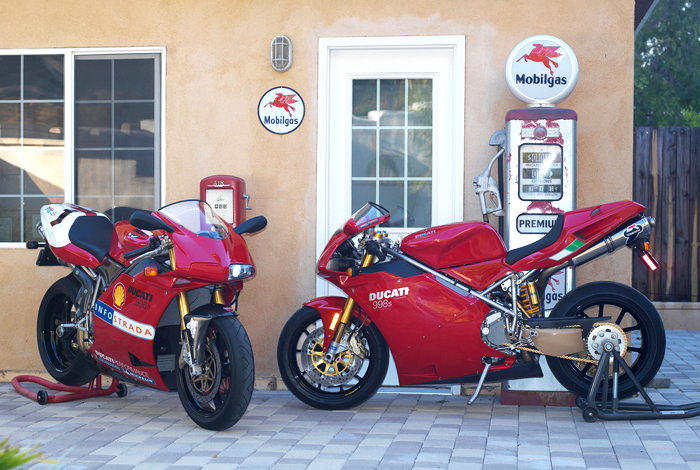 The editor's 2nd Generation Ducti Superbike collection includse this 2002 996R and 2004 998S/R Final Edition. Still a 2nd generation Massimo Tamburini design, the 996R featured the all-new Testastretta deep sump sand cast engine, Titanium Valves and Rods, to homologate it for World Superbike, and cure the oil starvation and breaking engine cases on the factory Corse race bikes which until then were running the biggest possible displacement 955cc engines. The power increase on the new 996R motor was nearly 40 horsepower more than the previous 916, with an equally impressive low end torque increase. The bore x stroke was 110 x 63.5 mm. The factory Ducati Corse Superbike team had been struggling to learn how to set up the new 999RS factory race bikes that first year. Privateer Frankie Chili however, was on ad older 998F bike prepared by the legendary Bologna tuning shop NCR, which was running one of the new 999RS motors. With the old 998 chassis running the new 999R engine, Frankie had the perfect combination of Ducati handling and power, and would trounce the factory 999RS bikes to win Race Two out right at Monza that year. 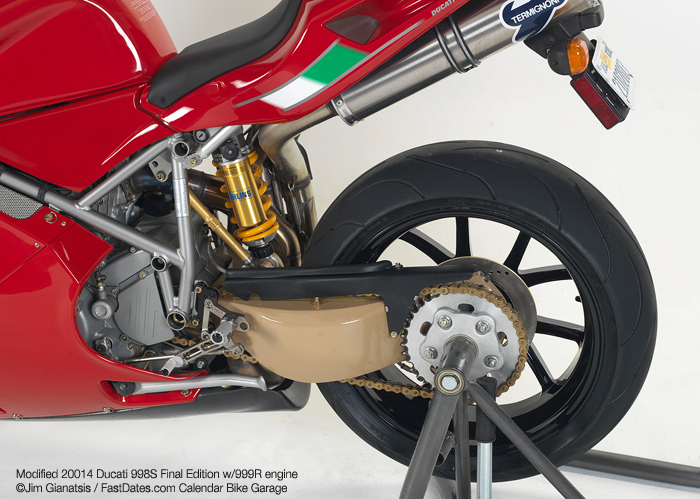 Little noticed that year of 2004, what with all the fan fare of Ducati introducing the new 999 model, they started off the year by also releasing a numbered 998S Final Edition model. Fast forward 11 years later and there I am browsing the Ducati motorcycle ads on E-Bay where I see what appears to be a brad new 998S Final Edition with the much coveted Corse extended length lightweight Magnesium Swingarm/ This was the swingarm the factory team used from the 1999 season as it was said to improve handling. I dove further into the E-bay listing to sew the bike actually was brand-new, never having been ridden, with just 2 miles of dyne running on the Speedometer. And that it had been heavily modified within a year of purchase with a 999R crate engine, Marchesini Magnesium race wheels, and a full Termignoni Ti Racing Exhaust System with computer re map, 520 Chain and Sprocket kit. The bike had been built and tuned at Ducati AMS / Advanced Motorsports in Dallas, TX. On contacting the seller, I found that he had some $40,000 invested in purchasing and building the bike, plus a $5,000 6-year storage bill from AMS. He told me that once the bike was complete, his US government job had transferred him to Europe, and he had to put both this modified 998S and a new Ducati Desmosedici RR into storage without having ridden either. When he finally returned back to the USA in 2012 the government Budget Sequestration of 2013 left him without a job. Soon the ofener had to sell off his brand new, never have been ridden ultimate Ducati sportbike collection. I made an offer for his beautiful new super trick 998S Limited Edition and he accepted. A shipping company picked the bike up at Mike's house and delivered it to my local dealer Pro Italia, Glendale, CA, where it was checked out, including a good clean out of the fuel system, and installation of fresh new Pirelli tires. The Corse Magnesium Swingarm is 1-inch longer than the stock Aluminum single sided swingarm and about 4 lbs. lighter. Note the NCR Titanium Adjustable Foot Controls, 520 Chain Kit, Termignoni Titanium Full Race Exhaust, and Marchesini Magnesium race wheels. I also added those beautiful NCR billet Titanium Adjustable and Folding Foot Controls which are the same that as Chili used on his NCR race bike back in 2004. This new 998S is so beautiful, at first I didn't want to even ride it, but what good is a Ducati if it isn't ridden? Particularly possibly the world's finest 2nd Generation . And if I keep the miles low, it should not devalue it any. So far I've ridden it twice on the twisty and high speed canyon roads of the santa Monica Mountains outside Los Angles and i have to say, it is the best 2nd Generation Ducati Superbike I've every ridden. The handling, particularly with the longer swingarm, is simply incredible, and the 999R engine is incredible with its broad torque and super powerful power band right off idle. It is a nicer bike overall in handling than the bigger feeling 3rd and 4th Generation Ducati Superbikes. Only the new 5th Generation Panigale 1199 handles better. But the Testastretta 999R motor with its awesome power band, is a far more enjoyable engine to ride on the street and canyons than the new higher revving short stroke Superquadro found in the new 1199. Championship points leader Tom Sykes (far right) joined Guintoli and Melandro on the podium for Race Two after Kawasaki team mate Loris Caz too them both our in Race One. Sepang (Malaysia), Sunday 8 June 2014 – Marco Melandri (Aprilia Racing Team) came out victorious in the second World Superbike race of the day at the Sepang International Circuit, making it two out of two in front of an enthusiastic Malaysian crowd that reached a total of 34,528 spectators over the three days. 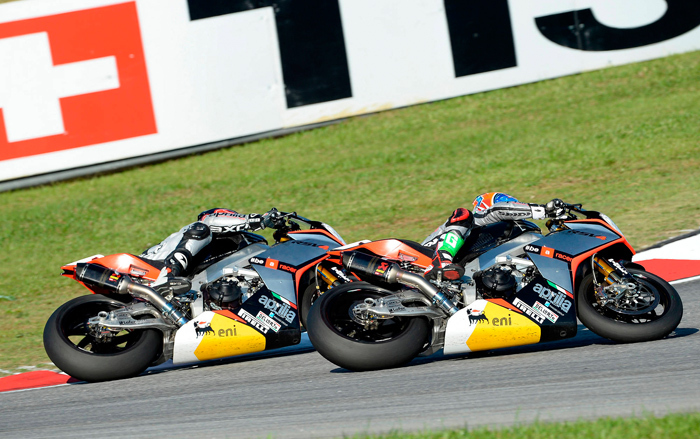 The Italian got the better of teammate Guintoli in the final lap of the race, with the two swapping positions three times before crossing the line. It was the second double of Melandri’s career after the one he scored in Brno two years ago, aboard the factory BMW.machinery he was riding at the time. 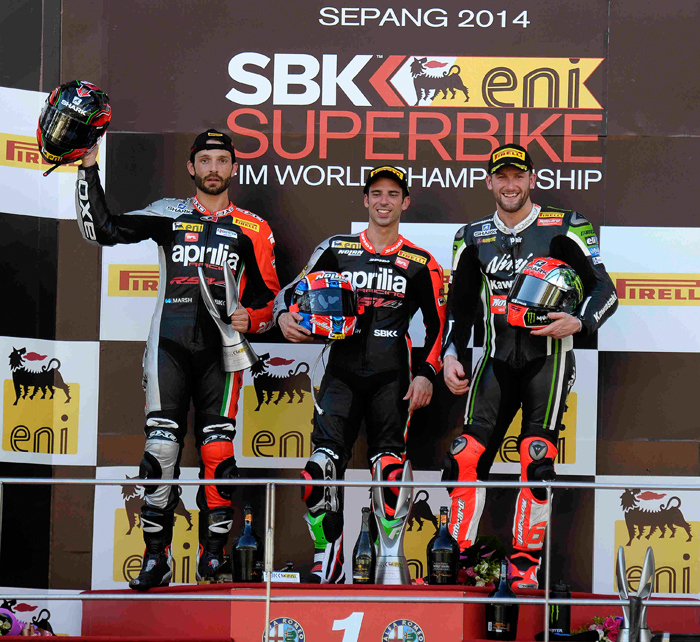 The first ever race at Sepang for the eni FIM Superbike World Championship was a thriller, with Aprilia Racing Team's Marco Melandri and Sylvain Guintoli locked in a titanic battle for victory until the flag. The race was incident packed from the start as Loris Baz tangled with his Kawasaki racing team mate Tom Sykes, both riders falling and taking with them Alex Lowes (Voltcom Crescent Suzuki). With the incident creating a gap at the front the race, Sylvain Guintoli and Marco Melandri exchanged places at the front with Melandri eventually coming out as the victor and claiming his first win as a factory Aprilia rider. Guintoli was second. Behind the leading two, a three way fight raged with Eugene Laverty (Voltcom Crescent Suzuki) claiming the final podium spot ahead of Chaz Davies (Ducati Superbike Team) and Toni Elias (Red Devils Roma Aprilia) who were 4th and 5th respectively. Sixth at the end of the first 16 lap encounter of the day went to Jonathan Rea (Pata Honda World Superbike Team) who recovered from a bad start to get the better of his team mate Leon Haslam. David Salom (Kawasaki Racing Team) claimed the EVO honours with a spirited ride to 9th overall ahead of Leon Camier (BMW Motorrad Italia) who was 10th. Bryan Staring (Iron Brain Grillini Kawasaki) scored points with 13th on his first Superbike start of the year. Race One Results: 1. Melandri (Aprilia) 16 Laps/88.768 km in 33'42.359 average 158.016 kph; 2. Guintoli (Aprilia) 0.620; 3. Laverty (Suzuki) 12.865; 4. Davies (Ducati) 15.437; 5. Elias (Aprilia) 15.723; 6. Rea (Honda) 31.304; 7. Haslam (Honda) 34.093; 8. Giugliano (Ducati) 35.804; 9. Salom (Kawasaki) 42.031; 10. Camier (BMW) 49.465; 11. Guarnoni (Kawasaki) 53.715; 12. Andreozzi (Kawasaki) 1'07.783; 13. Staring (Kawasaki) 1'10.746; 14. Toth (BMW) 1'18.143; 15. Lanusse (Kawasaki) 1'21.026; 16. Yates (EBR) 1'49.054; RT. Canepa (Ducati); RT. Morais (Kawasaki); RT. Sebestyen (BMW); RT. Corti (MV Agusta); RT. Foret (Kawasaki); RT. Lowes (Suzuki); RT. Baz (Kawasaki); RT. Sykes (Kawasaki); SH. Badovini (Bimota) 55.683; SH. Iddon (Bimota). Guintoli (here at front front) held the lead on his Apriia team mate going into the final corner where Melandri dove inside to take the race lead a at the finish line by just 2 feet for one of the closet World Superbikerace finishes ever. Tom Sykes (Kawasaki Racing Team) made amends after being taken out in race one to take the final spot on the podium, despite a painful wrist. The Brit still leads the standings after the sixth round whilst Guintoli now lies second in the title race, only 13 points behind the reigning champion. The 2nd race of the day race was flagged on the 3rd lap after the MV Agusta of Claudio Corti expired resulting in a small fire that needed to be extinguished by the track side marshals. With only 3 full laps completed the grid for the restart was determined by the positions at the end of the third revolution, meaning Sylvain Guintoli (Aprilia Racing Team) was on pole ahead of Toni Elias (Red Devils Roma Aprilia) and Marco Melandri (Aprilia Racing Team). The restart, over 10 laps of the Sepang International Circuit did not disappoint, with the leading five riders locked together until the two factory Aprilia riders eased clear. Marco Melandri had to take avoiding action as he misjudged his braking point on the second lap, narrowly missing the back of his team mate Guintoli and Toni Elias. Thankfully everyone stayed aboard treating the fans to one of the closest race finishes of the year. 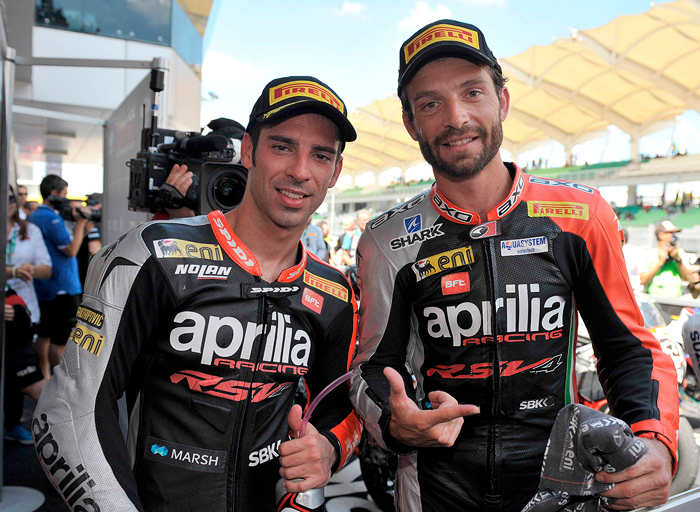 Melandri and Guintoli exchanged places several times on the final lap with the Italian getting the better of his team mate once again to take a double win on the championship’s first visit to Sepang. Toni Elias (Red Devils Roma Aprilia) edged Loris Baz (Kawasaki Racing Team) for fourth, with Jonathan Rea (Pata Honda World Superbike) finishing in sixth place. Leon Camier (BMW Motorrad Italia) was the best classified EVO rider, racing to 12th at the end of the race ahead of David Salom (Kawasaki Racing Team). Alessandro Andreozzi (Pedercini Kawasaki), and his team mate Romain Lanusse both crashed out, thankfully without injury. Tony Elias (behind) led the opening laps of Race Two beore dropping back to battle over 3nd place with Sykes (1) and Baz (76). Race Two Results: 1. Melandri (Aprilia) 10 Laps/55.480 km in 21'00.424 average 158.461 kph; 2. Guintoli (Aprilia) 0.166; 3. Sykes (Kawasaki) 2.689; 4. Elias (Aprilia) 5.386; 5. Baz (Kawasaki) 5.514; 6. Rea (Honda) 7.073; 7. Laverty (Suzuki) 7.476; 8. Davies (Ducati) 11.057; 9. Lowes (Suzuki) 15.866; 10. Giugliano (Ducati) 16.206; 11. Haslam (Honda) 16.488; 12. Camier (BMW) 23.820; 13. Salom (Kawasaki) 30.653; 14. Guarnoni (Kawasaki) 31.266; 15. Canepa (Ducati) 43.009; 16. Staring (Kawasaki) 46.127; 17. Morais (Kawasaki) 58.167; 18. Toth (BMW) 1'00.017; 19. Sebestyen (BMW) 1'03.574; 20. Yates (EBR) 1'13.522; RT. Lanusse (Kawasaki); RT. Andreozzi (Kawasaki); RT. Foret (Kawasaki); SH. Badovini (Bimota) 29.094; SH. Iddon (Bimota) 36.354. Standings (Round 6 of 13): 1. Sykes 201; 2. Guintoli 188; 3. Rea 179; 4. Baz 170; 5. Melandri 147; 6. Davies 130; 7. Giugliano 96; 8. Laverty 90; 9. Elias 89; 10. Haslam 89; 11. Lowes 80; 12. Salom 56; 13. Canepa 39; 14. Camier 30; 15. Guarnoni 19; 16. Scassa 16; 17. Foret 14; 18. Corti 10; 19. Morais 10; 20. Andreozzi 8; 21. Allerton 6; 22. Bos 5; 23. Staring 3; 24. Toth 2; 25. Fabrizio 2; 26. Lanusse 1. Manufacturers: 1. Kawasaki 216; 2. Aprilia 212; 3. 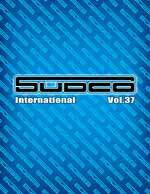 Honda 179; 4. Ducati 158; 5. Suzuki 140; 6. BMW 36; 7. MV Agusta 10. Results: 1. Vd Mark (Honda) 14 Laps/77.672 km in 30'23.854 average 153.312 kph; 2. Cluzel (MV Agusta) 0.018; 3. 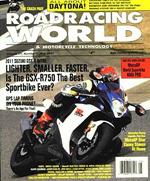 Sofuoglu (Kawasaki) 4.526; 4. Rolfo (Kawasaki) 4.651; 5. Zanetti (Honda) 9.187; 6. Wilairot (Honda) 12.494; 7. De Rosa (Honda) 13.515; 8. Jacobsen (Kawasaki) 20.400; 9. Zaidi (Honda) 20.579; 10. Bussolotti (Honda) 29.038; 11. Gamarino (Kawasaki) 33.204; 12. Russo (Honda) 39.729; 13. Nocco (Kawasaki) 48.739; 14. Leonov (MV Agusta) 50.260; 15. Coveña (Kawasaki) 1'02.471; etc. Standings (Round 6 of 12): 1. Vd Mark 115; 2. Cluzel 82; 3. Marino 76; 4. Zanetti 60; 5. Coghlan 60; 6. Sofuoglu 54; 7. De Rosa 54; 8. Rolfo 49; 9. Jacobsen 40; 10. Tamburini 37; 11. Bussolotti 27; 12. Russo 25; 13. Wahr 23; 14. Wilairot 23; 15. Gamarino 21; 16. Menghi 19; 17. Kennedy 19; 18. Leonov 15; 19. Nocco 11; 20. Gowland 9; 21. Zaidi 7; 22. Coveña 7; 23. Schmitter 3; 24. Calero 3; 25. Rogers 1. Manufacturers: 1. Honda 136; 2. Kawasaki 103; 3. MV Agusta 90; 4. Yamaha 70; 5. Triumph 9. 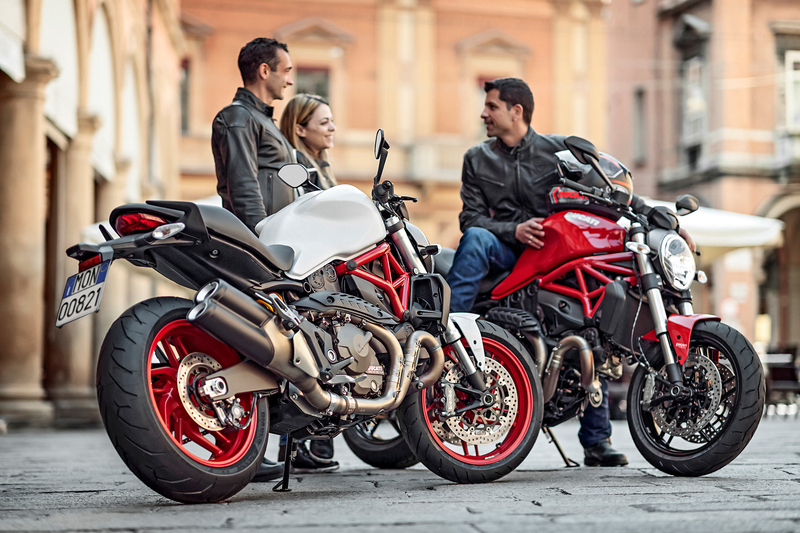 Borgo Panigale (Bologna), Italy, 28 May, 2014 – Ducati announces the brand new Monster 821, a mid-size entry for the third generation of the iconic naked model and the latest chapter in the Bologna-built motorcycle’s famous story. Underlining Ducati’s strong association to the Bologna region, the company has chosen to release the first images of the new model portrayed in typical Bolognese ambience. 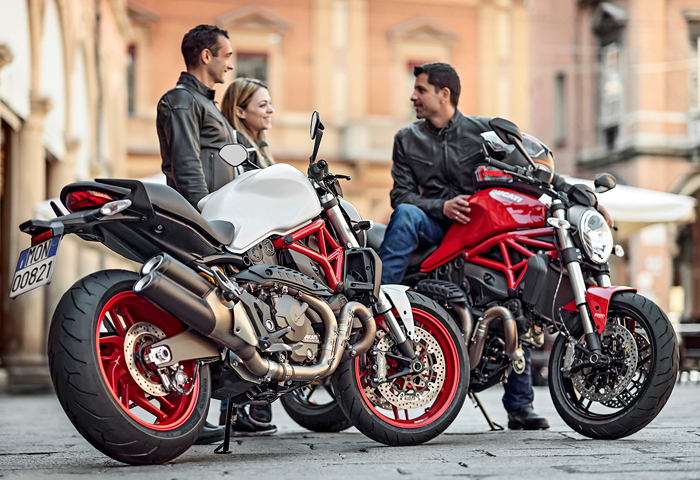 Available in Ducati Dealerships from July 2014 onwards, the Monster 821 Dark is presented in dark stealth with black frame and black wheels, while the Monster 821 is dressed in Ducati red with red frame and black wheels or star white silk with red frame and matte red wheels. Both red and white liveries are equipped with colour-matched single-seat covers. The brand new model is also made available to restricted license holders with the specially regulated power versions of 25kw for Switzerland and 35kw for other participating countries. 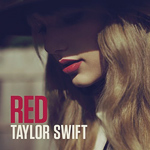 USA pricing: 821 Red, White - $ 11.495, 821 Dark - $10.995. Calendar Kitten Lindsay Hancock and the silver James Dean Porsche 550 Spyder influnced Triumph Tracker named "Ivan the Terrible". Look for this and other cool Richard Pollock built Mule Motorcycle Calendar Bikes in our Calendar Bike Garage. 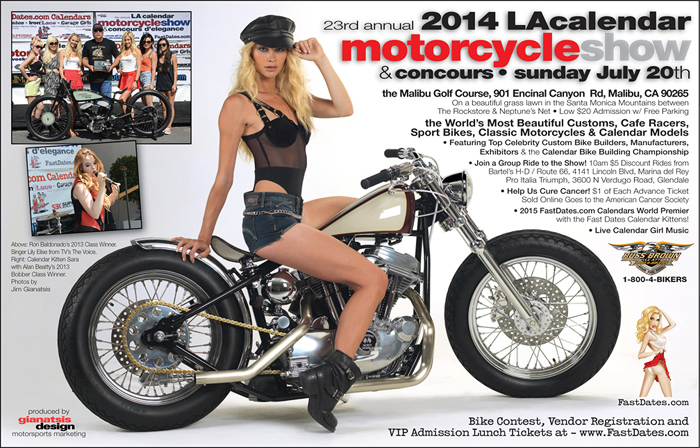 Many of America's top Celebrity Custom Bike Builders will be making their return to this year's 2014 LA Calendar Motorcycle Show & Concourse d' Elegance now relocated to the beautiful Malibu Golf Course in the Santa Monica Mountains above the Pacific Ocean on Sunday July 20th. Featured builders include Richard Pollock / Mule Motorcycles who just took 1st Place Custom at the 2014 Quail Motorcycle Gathering on May 17th with his just completed custom Triumph "Ivan the Terrible" which featured a James Dean Porsche 550 Spyder build theme. Pollock, known for his trademark Street Tracker style twin cylinder customs, plans to unveil two new bikes at this year's Calendar Show. His popular Mule Motorcycle customs have been photographed and featured by Show producer Jim Gianatsis in the FastDates.com Motorcycle PinUp Calendars many times over the last 15 years. Also returning in July to this year's Calendar Show is 7-time consecutive Class and Best of Show winner Jim Giuffra / AFT Metric Customs with the AFT Spokesmodels who help build the shop's custom bikes. They will be premiering their first new build in 2 years, and will be awarding the AFT Customs Visionary Award to the most innovative custom bike at the Show. Other premier builders attending include the legendary Ron Simms / Ron Simms Customs making his only visit to SoCal with his Simms Big Rig Display Truck featuring an extensive lineup of all-new bikes in both the full-dress Bagger category, and his popular Softail and Bar Hopper customs. Plus you can expect past Calendar Show winners like TV personality Russell Mitchell / Exile Cycles, eclectic builder Shinya Kimura / Chabott Engineering, and custom sportbike builder Chris Redwing / MotoGP Werks among many others showing off their latest builds as well. 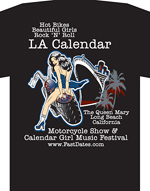 The 2014 LA Calendar Motorcycle Show & Concourse d'Elegance continues its now 23rd year tradition as the premier outdoor streetbike event in America with the Calendar Bike Building Championship & Concourse d' Elegance, top Celebrity Builders, selected Vendors and Exhibitors, and the live Calendar Girl Music Show. This year's designated charity is the American Cancer Society with a portion of gate receipts going to support their Research and Patient Care programs. Their will also be Motorcycle Dealership sponsored group rides to the Show on Sunday morning with additional information on the Show's website. This year the Show moves to the Malibu Golf Course off Encinal Canyon Road, between Pacific Coast Highway 1 and Hwy 101, in the beautiful Santa Monica Mountains. The Show always kicks off the world premier of next year's new 2015 FastDates.com Motorcycle PinUp Calendars featuring the world's top road race and custom motorcycles with the beautiful SBK World Superbike Calendar Kittens Jitka and Petra from the Czech Republic featured in the Calendars in attendance at the Show. 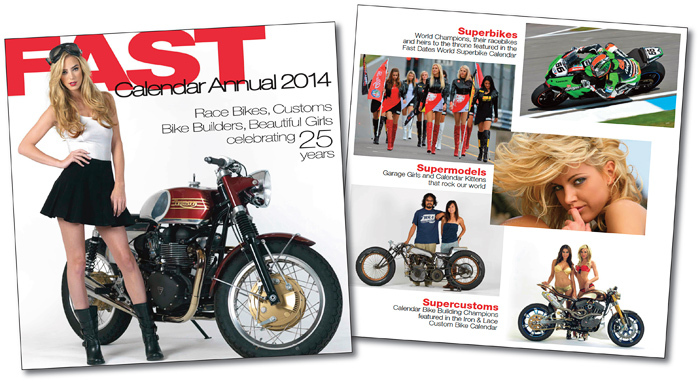 2014 Fast Dates World Superbike and Garage Girls Calendars, and the new 2014 Fast Calendar Digital Magazine. 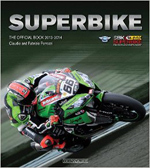 Laguna Seca World Superbike and the LA Calendar Motorcycle Show in July 2014! 2014 - The FastDates.com Calendars and producer / photographer Jim Gianatsis are excited to announce an agreement with SBK World Superbike and the international model agencies PetrasAngles.com and UmbrellaGilrsUSA.com to bring beautiful Czech Republic SBK grid girls Jitka and Petra to the United States this July 2014 to appear at Laguna Seca SBK World Superbike round at Mazda Raceway Laguna Seca the weekend of July 11-13th and at the LA Calendar Motorcycle Show in Malibu, CA on Sunday July 20th. These two 6-foot 2-inch tall long legged, blond hair professional supermodels hail from the capital of the Czech Republic, Prauge, and have been featured on SBK world TV race broadcasts the last 3 years standing at the front of the SBK World Superbike starting grid towering above the race bikes and riders in their uniforms with umbrellas to showcase SBK's title sponsors Pirelli Tires, Agip Fuels and Lubricants, and Alfa Romeo Automobiles. In their official uniforms with 6-inch heels on their platform boots, Jitka and Petra tower nearly 7 feet tall and can intimidate the bravest factory racers and experienced photographers! Both these Czech mates are already official FastDates.com Calendar Kittens having shot for the Calendars with contributing Italian photographer Max Oliana at the 2012 and 2013 SBK rounds at Bruno and Silverstone for the current 2014 and upcoming 2015 Fast Dates World Superbike and Garage Girls PinUp Calendars. 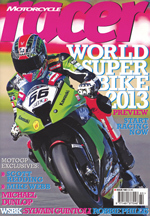 Meet the offical SBK Fast Dates World Superbike Girls Here! Mule Motorcycles Triumph Bonneville Tracker now in the Calendar Bike Garage! Supermodel Melena Costa an a Sportster Cafe Racer. 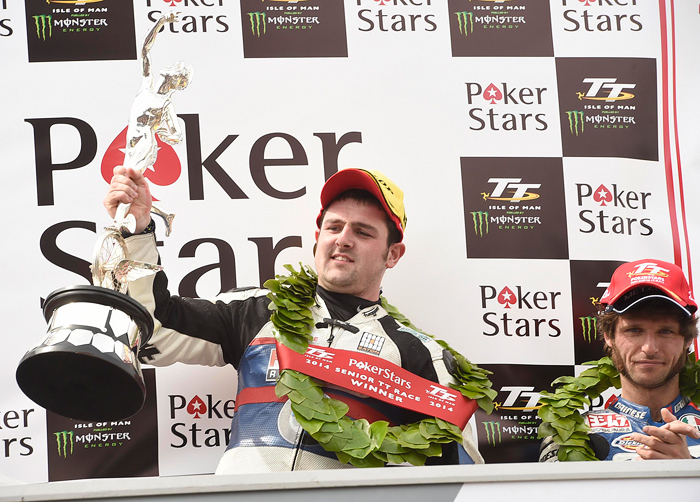 June 6th - Michael Dunlop joined Steve Hislop and Phillip McCallen on 11 wins at the Isle of Man TT Races fuelled by Monster Energy when he took Friday afternoon’s PokerStars Senior TT race, the second year in succession when he’s won 4 races in a week. A strong performance by Chaz Davies and the Ducati Superbike Team in today’s first Superbike race at the Sepang International Circuit in Malaysia; the British rider crossed the line in fourth place, before concluding race two in eighth position; Davide Giugliano finished the two races eighth and tenth. Race 1 – Today’s races were played out in very hot conditions (air temperature 32°C, track 52°C) and high levels of humidity. Starting from eighth on the grid, Davies was quickly able to make up a number of positions and was lapping fourth through the opening stages. He battled with Elias and got past him on lap six to move up into third position. In the final laps, a drop in grip prevented Chaz from defending his position as he would have wanted and he was passed by Laverty. The Ducati man then continued to fight it out to the wire with Elias, ultimately crossing the line ahead of the Spaniard to earn a very worthy fourth place finish. For Giugliano it was a more frenetic race, and not helped by the fact that he felt unwell last night and awoke this morning with a fever. A collision at the second corner caused several riders to crash in front of Davide and the Italian rider had to almost stop in order to avoid suffering the same fate, falling back to fourteenth position as a result. Pushing hard to recover, Davide was able to pass several riders over the next two laps and was already up into seventh by lap three. Fighting with Haslam, Giugliano passed the British rider on lap seven only to be repassed soon after. The Italian gave it his all to the line but, losing ground in the final stages due to a lack of grip, he had to settle for final eighth position. Race 2 – Temperatures had further increased for the second race, with the track up to 59°C. The two Ducati Superbike riders got off to a fairly good start and were lying sixth (Giugliano) and eighth (Davies) when, on lap four, Race Direction stopped the race with a red flag after another rider's bike left oil on track. A ‘quick restart’ and the race, shortened to just 10 laps, got underway. This time Davide positioned eighth after the opening lap, followed by Chaz, tenth. Both riders were able to pass Haslam early on and towards mid-race they both battled with Laverty but, losing ground in the closing stages, with a more dramatic drop in grip than in race one, the Ducati men closed the race in final eighth (Davies) and tenth (Giugliano) position. After six of fourteen scheduled rounds, Davies is in sixth position in the general standings, with 130 points, with Giugliano right behind him in seventh place (96 points). Ducati lies fourth in the manufacturer’s classification with 158 points. Pata Honda riders Jonathan Rea and Leon Haslam scored valuable championship points in today's two sixth-round World Superbike championship races at Sepang in Malaysia but were unable to challenge at the front of the field. Today's two 16-lap encounters at the fast and flowing 5.548km Sepang circuit near Kuala Lumpur were both won by Marco Melandri, with Jonathan Rea finishing the two races in sixth position as he battled his Honda CBR1000RR Fireblade SP with temperatures in the mid-30s and the track above 50˚C. Rea was innocently caught in a first lap crash in the first outing and was forced off the Sepang circuit at turn three before rejoining in last place. 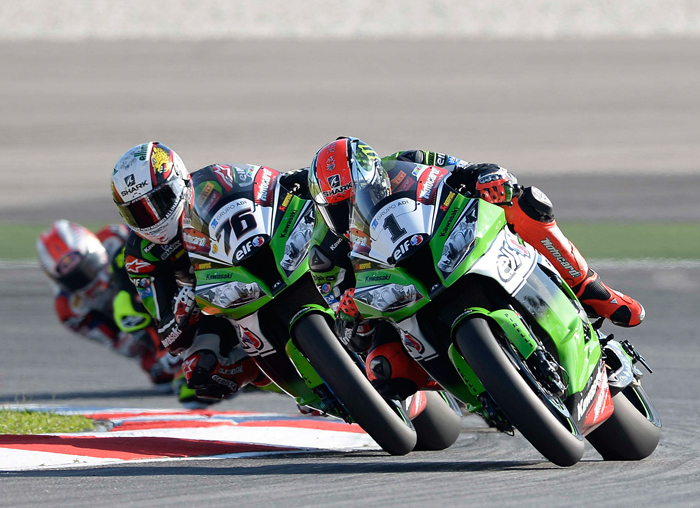 The 27-year-old quickly set about taking advantage of the absence of series leader Tom Sykes and scored ten valuable championship points at the flag. Race two was interrupted by oil on the track and restarted over ten laps, with Rea starting from seventh place. He matched the pace of riders in front of him but was not able to improve on his first race result. Rea's Pata Honda team-mate, Leon Haslam got a good start to race one but experienced corner entry problems on his way to seventh place. His second outing was no easier in the Sepang heat and the 30-year-old British rider could finish no better than eleventh. The Alps and Lakes motorcycle tour takes you through a beautiful part of European motorcycle paradise; the Alps. The contrast between the beautiful lakes in southern Germany and Austria and the towering mountains that reach up to more than 10,000 ft is nothing less than breathtaking. This area is the famous background for the movie "Sound of Music“. This vacation offers a little bit of everything: beautiful and relaxing rides through the valleys; some mountain roads and passes; and great vistas and sights, including King Ludwig‘s castle, Herrenchiemsee, and the historic city of Salzburg. The tour consists of five riding days, one of them is a rest day – which means that you stay two nights at the same hotel. This is a great opportunity to explore a little bit more, ride around the countryside, walk through town, meet the locals and sample some of the local food. The tour will take you through Germany and Austria, and on the rest day you can even add Italy to your list if you are so inclined. • Mountain Nationals at Miller Motorsports Park in Tooele, UT May 24-25. Share your Ducati Passion in the Ducati Grandstand during the 2014 FIM Superbike World Championship at Mazda Raceway Laguna Seca on July 11-23th! The Ducati Grandstand at Mazda Raceway Laguna Seca on July 11 – 13, 2014 will be the place to be to watch all of the nail-biting action for the only US stop of the 2014 FIM Superbike World Championship. In collaboration with Ducati, Mazda Raceway Laguna Seca is selling an exclusive Tribuna Ducati Ticket Package for $199 while supplies last. Get yours and join fellow Ducatisti as we cheer the Ducati Corse team to victory! May 23rd - Today Dorna announced that Michelin will take over from Bridgestone as the spec-tire manufacturer in the MotoGP World Championship beginning in 2016 and it turns out that they didn’t have much competition: The French company was the only tire manufacturer to submit a formal tender. At the beginning of May 2014 Dorna, in agreement with the FIM, opened a tender for tire manufacturers interested in becoming Official Tire Supplier to MotoGP. Interested tire manufacturers were able to request the technical specifications from Dorna’s Managing Director Javier Alonso, with three potential tire suppliers initially expressing an interest – before Michelin alone made a formal tender before the May 22 deadline. Dunlop Motorsport issued a release today explaining why it didn’t submit a tender to Dorna. “MotoGP continues to be a very strong global event, and we are proud of our long-standing relationship with the MotoGP organizers through our continued supply to the FIM Moto2 and Moto3 World Championships,” said Sanjay Khanna, the managing director of Dunlop Motorsport and Motorcycle EMEA. “Dunlop is in the fortunate position of having many strong partnerships with motorcycle manufacturers and leading championships around the world. We have taken the decision to focus on developing and supplying tires for these important partners for the immediate future.